It’s safe to say that the left is in full-blown panic mode over the Supreme Court vacancy and have already begun viciously targeting possible Trump pick and U.S. Court of Appeals Judge Amy Coney Barrett over her conservative values, her Catholic faith, and, most of all, her gender. A Tuesday afternoon CNN Newsroom segment illustrated that with guest and Daily Beast contributing editor Erin Gloria Ryan asserting that, if President Trump selects a woman, they “should be known as the Aunt Lydia of the Supreme Court” in reference to a villain from liberal dystopian show The Handmaid’s Tale. In addition, Ryan argued they shouldn’t be supported by women because they are the anthesis of feminism. They are obsessed with that boring show. It must be a sad sad life to be outraged at every single thing. So glad Hillary will never be president. Think I shall revisit some election night liberal meltdowns on YouTube just for the fun of it. You know what is going to happen don't you? The left and the press are going to expend all their energy against Barrett because they KNOW she will be the nominee. Trump will even encourage the notion. Then on the 9th he will nominate someone nobody is talking about and stand back and watch their heads explode. Such arrogance to assume that we all know and give a crap about that show. The Handmaid’s Tale villain? That means absolutely nothing to me. Never seen it and don’t have Netflix or Hulu or whatever it’s on. With the left going completely bonkers over Judge Barrett Im convinced shes not Trumps pick for the SC. Hes letting these idiots destroy themselves politically. 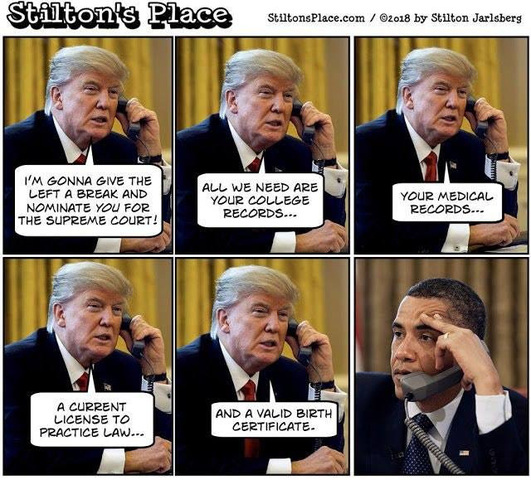 The president must be enjoying watching the left bend itself like a pretzel, and in the process of trying to tear down Judge Barrett, theyre insulting millions of Catholic voters. Why so many fellow Catholics fail to see the Democrat party is a bigoted anti-Semitic hate group is beyond me. The author did intend it as an allegory about Islam, idiot Leftists refuse to see that. Thats exactly what will happen! In the process the left has done a ton of Catholic bashing! It was an average book. The media and progressive left made it a something it is not. They even hate conservatives they don’t know. That’s about as irrational as it gets. That would be great. Exploding leftist heads are always great. I’d still like to see Amy Barrett on The Court. If not this time, then when The Zombie gets replaced. The Trumpbots keep nattering that in all things we should “trust Trump”. I agree with them on this. He did us right with Gorsuch; he’ll do us right again. Darn telephone. Not sure where anti-Semitic came from. I typed anti-Catholic. I hear Trump may be nominating a man. Obama, in fact. The Left is obsessed with tales. I agree. See my profile. 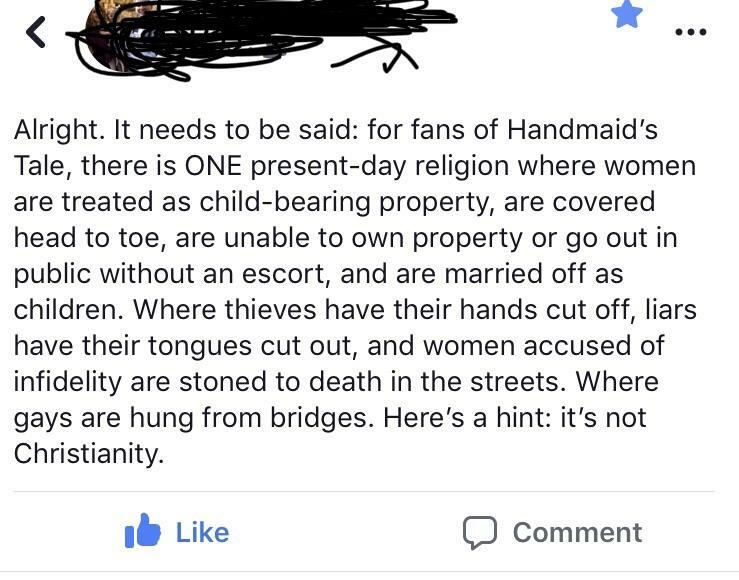 The “handmaid” reference is a metaphore for those who believe a decent woman has been replaced by a perverted world where beauty has become a horses rear end and their mentality has become lower that the droppings.